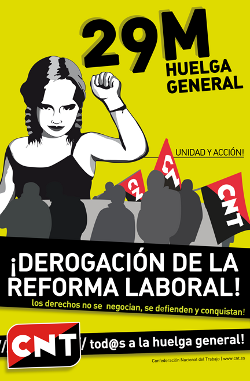 March 10 - The CNT, Spain's anarchist labor union, issued a statement yesterday announcing that they will be convoking a nation-wide general strike for March 29 against the labor reform passed on Thursday by the Parliament. This coincides with strikes that have already been called for Galicia and the Basque Country. In these regions the call was made jointly between "minority" unions such as the CNT and CGT as well as regionally-important unions linked to nationalist movements. On the national scale, however, the CNT has called the strike on its own. According to Spain's labor law, strikes are only official if called, or convoked, by a union or another official body. In the message announcing the strike call, the CNT said that they hope to give coverage to any workers' organizations that want to take action. Spain's two main unions, the UGT and the CCOO, have also called for a strike on that day, but speak only of "amending" the labor reform. This is a continuation of their policy of social peace - in February they signed a major agreement with the employers' confederation in which they gave major concessions. Recognizing the growing disillusion that many workers are feeling towards these unions, the CNT is promoting a different form of unionism, one which is not based on professional bureaucrats and policies of social peace, but rather on the direct action and solidarity of workers. This appears to be the first nation-wide general strike since the end of Francisco Franco's dictatorship to be called for by a union other than the CCOO or UGT, though it remains to be which unions, if any, will follow the CNT in calling for a general strike. The CNT's statement was clear that, although the strike is only called for March 29, this should be seen only as one step in a growing mobilization which seeks not only to remove this labor reform in its entirety, but also to go on the offensive with the goal of social transformation. Hopefully it's clear that by "calling for" a strike, they aren't just saying it would be nice. They are actually organizing for a general strike, and using their status as a union to make it legal for any groups of workers to strike, which would normally not be the case. Comisiones and the UGT have called a general strike for the 29th March. Cheers for posting, any Spanish posters want to keep us informed as to how this is progressing? so perhaps "Spain's two main unions, the UGT and the CCOO, have not yet called for any strikes, but speak only of "amending" the labor reform." should be updated, hm? CGT has also issued a call for a general strike on Mar 29. They just held a special congress to debate this, and the call came from that congress. In any case, the CNT is not seconding their call, but made their own. The CNT's Secretaria de Prensa (which I refuse to translate as "press secretary") posted their statement on here at about the same time as I posted this, but it seems to have disappeared. Does anyone know what happened? This text iis confusing. For example, it seems like you have written that the CNT in Galicia and Basque countries are making a mobilization together with the nationalist unions but they aren't. In the case of the Basques, think it was just because they weren't invited. The nationalist unions' demo is together with ELA, LAB, ESK, STEE-EILAS,CGT-LKN, EHNE and HIRU. So it looks as if in the Basque country the CNT and CGT are in different strikes. It's too bad that national syndicalism still has credibility in some parts of Spain. I'm gonna put some now on the spain thread.